The Hamburg sound artist Andreas Oldörp has been working with the interplay between sound and space since 1985. 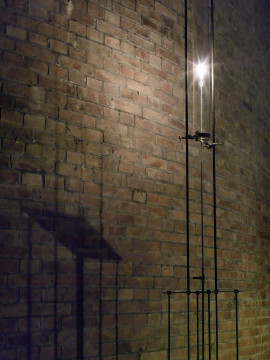 His installation “Arbeit mit Lager” with four “singing flames” was already on display in the Large Water Reservoir in 1997. Now, 14 years later, Oldörp has realised a re-installation of this fascinating, localised work. The small gas flames that cause the air in glass tubes of different lengths to vibrate create powerful, space-filling sounds that differ depending on the location. Constant bass sounds create powerful and changing sound textures in the space. Sometimes a few steps or a movement of the head already suffice in order to bring about a completely new sound environment. A fascinating, acoustic as well as visual work that is related to the space results, in which the visitor can embark on a journey to find new tones in a wonderfully light way. Opening: 30.06.2011 at 8 p.m. Wed – Sun 2 – 8 p.m.